Having a good home entertainment setup means you need some kind of storage to house your quality electronics.We all know that most living arrangements in Hong Kong can be quite small. You may dream of having a large wonderful TV cabinets but unfortunately you’ll have to settle for a smaller one. One option for this is the Justine Solid Wood TV Cabinet and Sideboard from the Decor8 Hong Kong furniture collection. Measuring at just 150cm in width, this is one of our smallest TV cabinets in our collection. 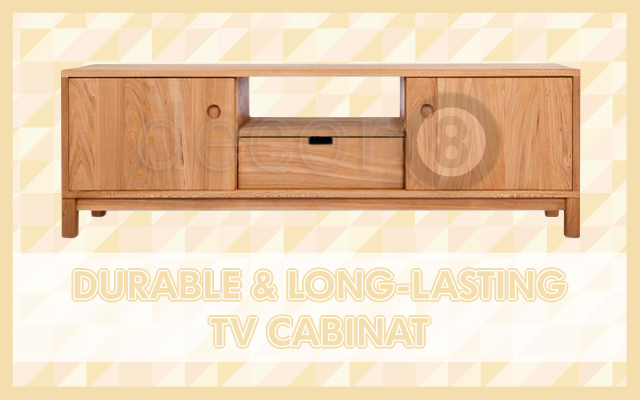 This natural warm furniture piece offers durability and long lasting option for a TV cabinet. The Justine Solid Wood TV Cabinet and Sideboard is constructed of premium imported solid elm wood. It has a natural hard wax oil finish to protect the wood from moisture that roams the humid air in Hong Kong. The storage area is separated into three components. Featuring two sliding doors on either side, this TV cabinet doesn’t take up much space with the absence of swing door compartments. In the middle compartment of this cabinet is one open shelving space and a storage drawer at the bottom. One of the reasons why some people love the Justine TV Cabinet is the small height of the legs. The reason is that it is great for hiding loose wires exposed from behind your electronics. Whether you choose to have your TV sitting on the cabinet or mounted on the wall is a matter of preference. Placing a TV on top of this cabinet is the perfect eye level for a person relaxing on their sofa. You will have plenty of space to place your items in or on the Justine TV Cabinet with all the ample storage space that it has to offer. This isn’t just for electronics since you can display and organise decor to give it your own style. If you look at the cabinet very closely, you can see that this cabinet sort of resembles a face. Bring a smile to your face and add this wooden masterpiece into your home whilst it is still available. This entry was posted in Storage, TV Cabinets and Side Boards and tagged durable, living room, modern design, sofa, solid oak, solid wood, Storage, tv cabinet, tv cabinets hong kong, wood cabinets.